(NEW YORK) — Skittles is taking its Super Bowl ad to the next level with the help of Michael C. Hall and the Great White Way. The Dexter actor is starring in Skittles Commercial: The Broadway Musical, an ad set to be performed in front of a live audience, airing during the Super Bowl on Sunday, February 3. In a teaser for the ambitious concept, Hall confides his doubts to a therapist. 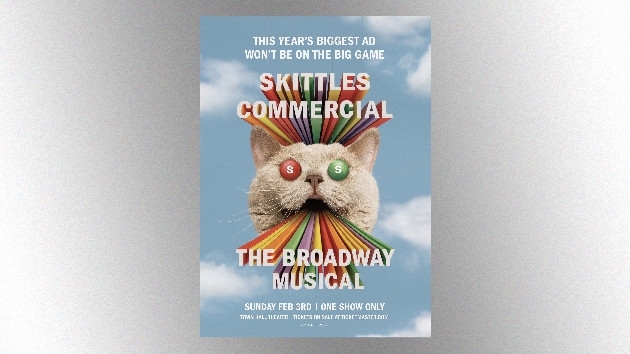 “It’s a live Skittles musical ad performed in a Broadway theater,” he clarifies. The ad will be performed at The Town Hall in New York City at 1 p.m. ET on Super Bowl Sunday. It will later air during the big game between the New England Patriots and the Los Angeles Rams at Mercedes-Benz Stadium in Atlanta. The one-time-only performance will feature a 17-person cast, including Hall. Tickets are on sale now at Ticketmaster.com, with proceeds going to Broadway Cares/Equity Fights AIDS. Skittles will be matching the donation.